A. We really wanted to adopt from a 3rd world country and provide a home to a child that would otherwise have very little opportunity for a future. There are really only a handful of countries that Americans can easily adopt from and from that list Ethiopia just surfaced as the best fit for us. We are thrilled to have Evyn Olivia as our daughter! A. When we started the process with AGCI we were told the estimated timeline would be 12-15 months for a baby girl, but we completed the process in just under 12 months. Q. Why does it cost so much? A. Our adoption cost about $30,000. The agency fee of about $27,000 covered everything from payment for AGCI, Ethiopian government fees, translation fees, travel, orphanage fees, medical, document fees, etc. Our agency provided us with a very detailed explanation of all the costs involved in the adoption. The last $3,000 were fees that we incurred post adoption. To readopt in our state we had to pay a lawyer about $1,500. We also estimate paying about $1,000 to our Social Worker for post adoption reports + mileage for her to drive to our home. We were able to raise all of the money for our adoption! Praise God!! We chose to send out letters to friends and family telling our story and inviting them into the process. I was timid to do this at first, but God blew us away with the response! The money trickled in for over 10 months. Little by little. Every single bit down to the last penny that we needed came in! It still makes me tear up just thinking about it. Those people who gave are forever a part of my daughter’s story. They made it possible for her to come home. One truth I hung on to through the process was that God ALWAYS funds his callings…and we should never let money stand in the way of pursuing the things God has called us to. Money is not an obstacle for Him! The other Truth I clung to was that we are ALL called to care for “the orphan”…while most will not choose to adopt, many will and can join the process and GIVE. Making yourself vulnerable and asking for help gives others the chance leverage their finances and be a part of the amazing story unfolding in your family. Q. Can I get a copy of your fundraising letter? 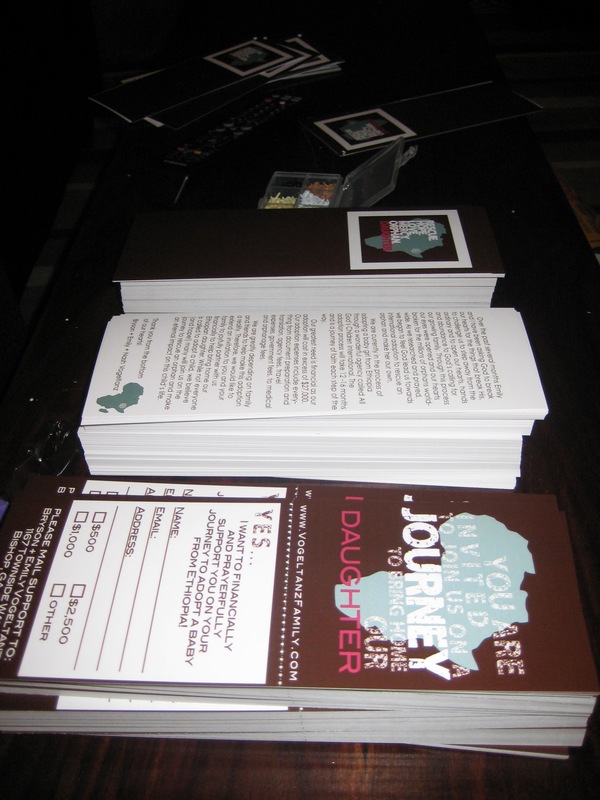 The letter consisted of 3 cardstock full color pages. Page 1: cover page w/ logo. Page 2: Letter. Page 3 Refridgerator reminder + tear off response card. The 3 cards were attached together with a small brad. Q. How old was your baby when you met her? Our parameters were a 0-12 month old baby girl. My prayer was that God would give us a baby who was 4 months old. When we received our referral, Evyn was 2 days shy of her 4 month birthday! When we arrived at Hannah’s Hope to pick her up she was 6 months old. Q. When did you get to know who your baby girl was? The first step in adoption is to complete the Dossier (which is basically a massive amount of paperwork and forms that we have to complete). Once your paperwork is completed and approved by the agency you are placed on the “waiting list” for a “Referral”. A Referral is when our agency matches us with a baby girl and sends us a picture and medical record of the baby and asks us if we would like to proceed with the adoption. On average the wait is about 5 months to receive your Referal after completing your Dossier, which was the case for our family. Q. Do you want (and/or are you able to have) more biological kids? A. Yes! Lord willing we will have many more biological kids over the next several years and possibly adopt again. We chose to adopt not because we were unable to have biological children, but because we really felt called by God to rescue an orphan and make her a part of our forever family. What an amazing responsibility and honor! Thank you for share your fundraising letter! Ideas are flowing now!!!! What a great fundraising idea! I know after we adopted our little girl (we had 2 older bio kids) we did plan to have more bio kids but after seeing the poverty in Ethiopia we felt God wanted us to adopt more…and so our next 2 children will be adopted. I can’t imagine we will have any more bio kids as it would almost feel selfish to me now, having 2 bio kids, to have more meaning less orphans will have a Mommy and Daddy. I know a lot of adoptive parents that feel the same way! My husband and I are at trying to decide on an agency to use for our adoption. I would love to talk to you about your experience if you can send me an email. We are in the same boat as Ashley. We are really impressed with AGCI but would love to speak with a family who has worked with them. Please email me if you have a minute! Thanks Casey! I’m so glad you found our letter helpful! So excited to hear you are adopting through AGCI. I was wondering if there is anyway to get a copy of your letter? When I clicked on the link it did not work. If there is anyway you can email ally1982@hrtc.net so I can see what you did in your letter that would be amazing. We are just starting the wonderful journey to bring our child home. I am scared to ask for $500! May I ask how much you raised from your letter? I don’t want to sabotage our efforts by asking too little (I had planned on $25, $50, $100, etc), but I also don’t want to turn people off by asking too much.